Qualification: MBBS from any Medical Institution recognized by the Medical Council of India. Registered with Punjab Medical Council/ Indian Medical Council. Selection Procedure: Selection of recruits is Based either Written Exam/Interview. How to Apply: Walk-in Interview Date and Time: 04.01.2019 10.00 a.m. onwards. Qualification: Post Graduation in Business Administration/Psychology/Sociology. Experience: Experience in Govt. Sector will be considered. Salary Per Month: Rs. 15000 /-, Knowledge of Punjabi: Candidates should have passed subject of Punjabi upto Matric standard. Age: 18 to 37 years as per rules of Govt of Punjab. Qualification: Masters in Public Health/Sociology/Social work. Experience: Experience in Govt. Sector will be considered. How to Apply: Candidate must fulfill eligibility criteria for the post he/she is applying for as on date of Walk in Interview of respective post. The applicant must read carefully all the guidelines and instructions mentioned on the website before appearing for walk in interview. Candidates must ensure to bring their original testimonials related to Qualification, Experience, Punjabi upto Matriculation, Age proof etc. and one self attested photocopy of all such documents for submission. Candidates must bring 2 latest passport size photographs at the time of interview.In case, any certificate/testimonial of an applicant is found fake at any stage of recruitment or issued by an incompetent authority, the eligibility/appointment of that applicant would be cancelled with immediate effect and a legal action may be taken against him/her. If any candidate is found not to be fulfilling the eligibility/selection criteria at the time of interview or at any point of time in the entire recruitment process by the screening or selection committee, his/her candidature will be cancelled/ rejected for the said post. Appearing for Walk in Interview does not imply that candidate has fulfilled all the criteria given in the advertisement and he/she is eligible for the post. Eligibility of the candidate will be determined after thorough scrutiny of the application filled by the candidate. If candidate is found not eligible by the screening committee, he will not be allowed to appear in the interview before the selection committee. Candidates will not be paid any TA/DA for attending the above said interview/test. Date & time of Walk In Interview: 17.12.2018 at 9.00 a.m. Check Here For Complete Official Notification. Qualification: Post graduate in Business Administration/Public Health/Psychology/Sociology. Knowledge of Punjabi: Candidates should have passed subject of Punjabi upto Matric standard. Experience: Experience in Govt. Sector will be considered. How to Apply: Candidate must fulfill eligibility criteria for the post he/she is applying for as on date of Walk in Interview of respective post. The applicant must read carefully all the guidelines and instructions mentioned on the website before appearing for walk in interview. Candidates must ensure to bring their original testimonials related to Qualification, Experience, Punjabi upto Matriculation, Age proof etc. and one self attested photocopy of all such documents for submission. Candidates must bring 2 latest passport size photographs at the time of interview. Appearing for Walk in Interview does not imply that candidate has fulfilled all the criteria given in the advertisement and he/she is eligible for the post. Eligibility of the candidate will be determined after thorough scrutiny of the application filled by the candidate. If candidate is found not eligible by the screening committee, he will not be allowed to appear in the interview before the selection committee. Candidates will not be paid any TA/DA for attending the above said interview/test. 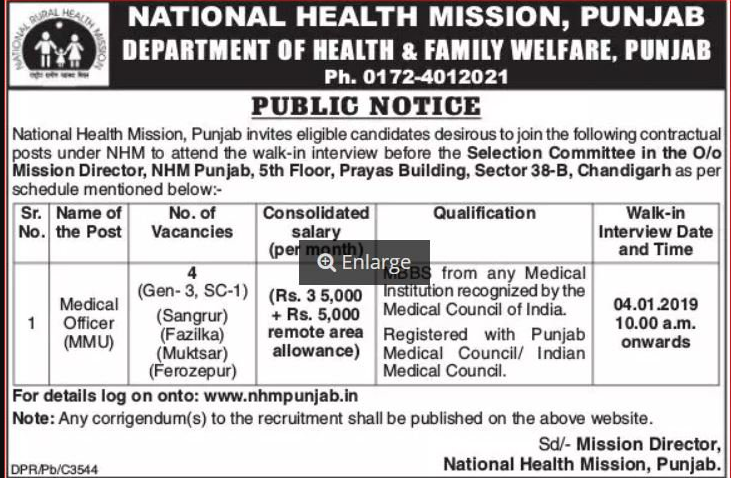 Date & time of Walk In Interview: 18.12.2018 at 9.00 a.m., Venue of Interview: O/o Mission Director, NHM Punjab, 5th Floor, Prayas Building, Sector 38 B Chandigarh. 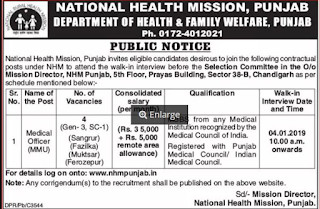 0 Response to "NRHM Punjab Jobs 2019-20 For 20 MO, Coordinator & Community Mobilizer Posts"